I want to thank you for an excellent job fitting the alcove units to my reception. The whole process from start to finish was professional, bespoke and the highest quality. The units were made to our specification to incorporate wiring for tv and sound systems and were fitted and completed within the timeframe agreed. I look forward to asking you to do further work in due course. I found Richard on the internet because I was looking for someone who worked in tulip wood and I wanted to commission a wall-standing bookcase. I had a good idea of what I wanted but the design process and the computer-generated drawings Richard produced helped give me a very clear idea of what the final product would look like. Richard followed the brief exactly. He assembled the bookcase on site as it was too large to come through the door. He was very tidy, protecting my floor and extracting any dust he produced. The bookcase is now in use, it’s exactly as I imagined and I am very happy with the process and the quality of Richard’s work. I would happily recommend him. If you are interested, tulip wood is a great wood if you want painted furniture as it is stable and has a tight grain. 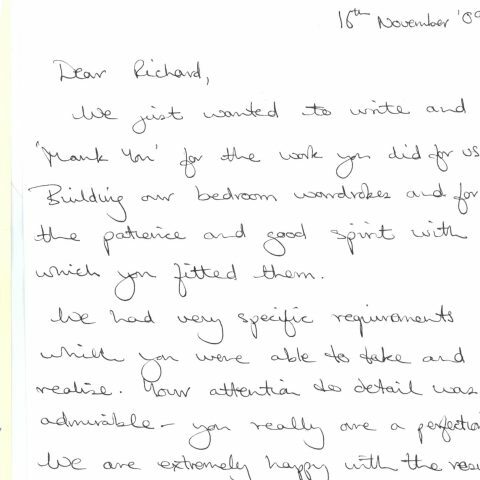 Richard has done four pieces of work for us, including two sets of fitted wardrobes for our bedrooms. We’re delighted with all the work he has done. 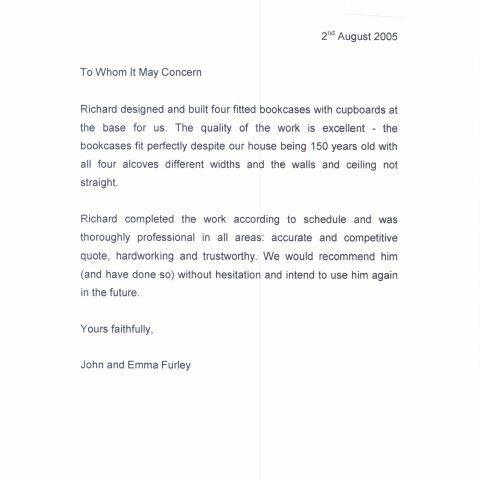 Richard was helpful from start to finish, from designing the furniture, working to schedule and even clearing up after the work. The end results are great – very high quality, carefully fitted and attractive furniture. We’d recommend Richard to anyone. 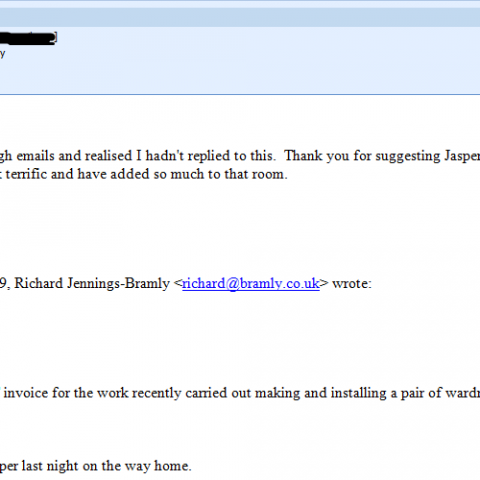 Richard Jennings-Bramly offers a perfect bespoke carpentry service. The shelving cabinet he made for us was created specifically to my design to fit an awkward space. He helped develop this design with expert advice and built a beautiful, enduring unit which was hand delivered and fitted perfectly. For such an amiable, professional and trustworthy service, it was great value for money and I wouldn’t hesitate to use him again. 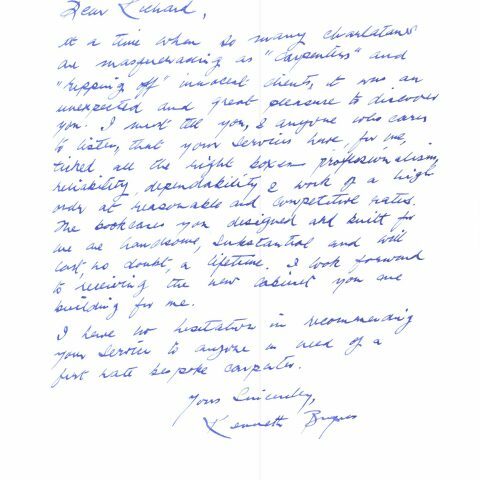 Richard was a pleasure to deal with. He took our requirements on board, and came up with alternative designs at varying budgets. We were very pleased with the end result – fitted wardrobes that blend in with the bedroom, with a bespoke shelving solution. The bookcases that Richard also constructed for us are an endless source of satisfaction. Equally as important as the end product, Richard is a gentleman, and is well aware of the need to minimise disruption and mess in the client’s household. The devil is in the detail, and Richard crafts beautiful pieces that instantly make a room more special. My cabinet has transformed a dull corner of my living room and made my house a home. 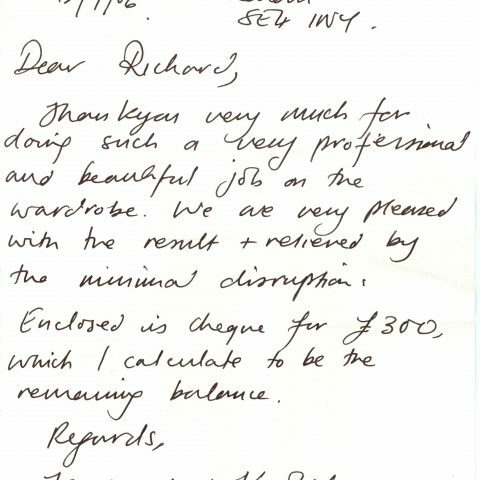 I invited Richard to quote on some bespoke fitted wardrobes and was immediately impressed with the initial designs and costs. Once commissioned the first class service continued right through to installation and after several years use they look and function as new. Having commissioned work from Richard on two separate occasions we would not hesitate to recommend him. He was friendly and helpful throughout the process, from consultation and design through to completing the work to schedule and budget. The items he produced were everything we had hoped for, and the perfect addition to our home. We’ve actually moved house now, to a larger place in Streatham, and it’s not inconceivable that we may need your services at some point in the future! Anyway, I hope you’re well, and let me know if the above isn’t quite what you’re after. After three solid days of painting the units are now fully painted and look great! 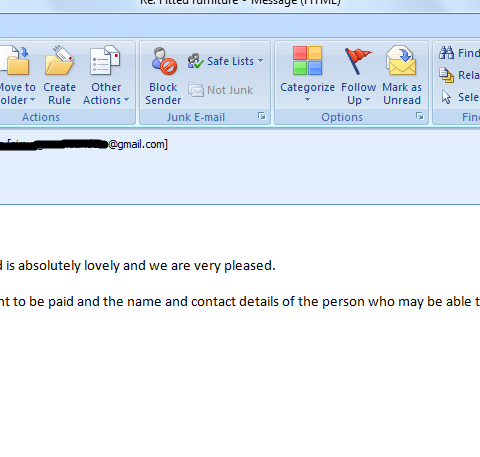 We are thrilled with them – thanks very much. Happy to send some photos once carpets are in and the units are in use, if you would like. Richard is a great craftsman. He listened to our ideas and took care with the design, he was easy to have in the house and we are delighted with the results: a stylish and functional wardrobe that fits the space perfectly. 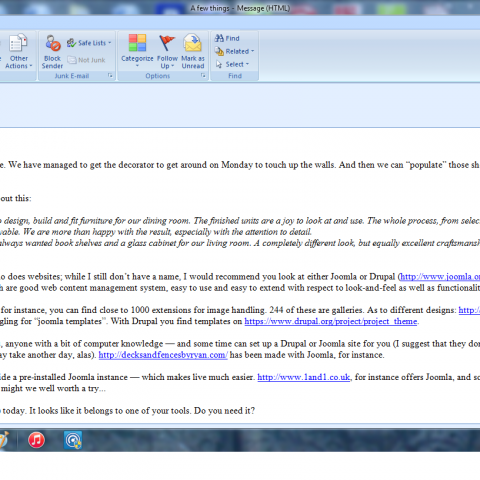 My friend Howard (cc’dl) is looking for someone to build some furniture for him. He’s a fan of the alcove units you built for us (btw we’re still really pleased with them and they’re looking great) so he asked to be put in touch. I’ll leave it to you both from here. Many thanks for all of your work on the cupboards – they look great and we are really pleased with the way everything turned out. We are having the cornice fitted this week so are looking forward to having the finished picture soon. 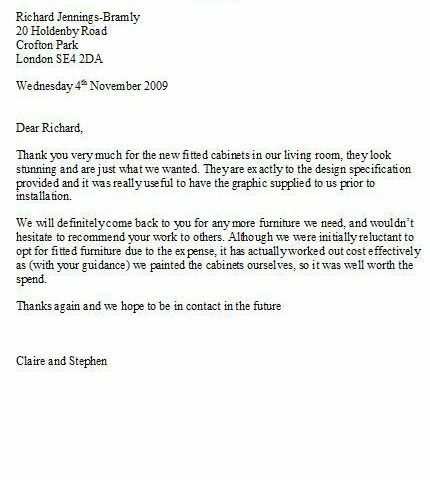 We originally contacted Richard to design, build and fit furniture for our dining room. The finished units are a joy to look at and use. The whole process, from selecting the wood and agreeing the design, to the fitting was very enjoyable. We are more than happy with the result, especially with the attention to detail. So we came back for more as we always wanted book shelves and a glass cabinet for our living room. A completely different look, but equally excellent craftsmanship. 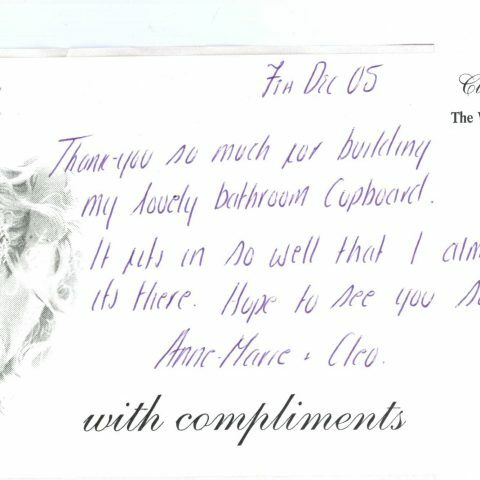 Many thanks – and thank you again for the wonderful job you did with the alcove shelves and cabinets. Many thanks to you and Matt for the good work! 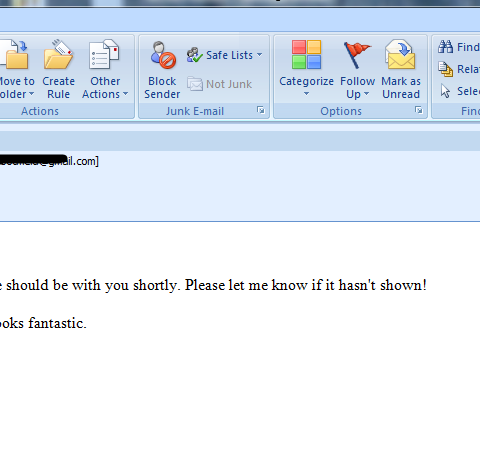 I wanted to thank you again for the fantastic job that you have done in building our wardrobes. They are without doubt the most pleasing feature of our house and the focus of a wonderful bedroom redecoration. We were very impressed by your expertise, but also in your conduct. We felt at home when working through designs with you and encouraged by your diligence and conduct throughout. It pleases me to see someone taking so much enjoyment out of their profession and pride in doing an excellent job. We wish you all the best and will recommend your services to many more people. Hope you are well, Scott here, you built 2 amazing wardrobes for us last year and we are looking for some more of your handy work! We would like to build cupboards/storage units for the space under our stairs. I was wonering if you a free to pop over maybe the first week of September to quote? Thanks Richard. We’ve now moved in to our new wardrobes and love them! Hi Richard, I added a recommendation to the forum a week or so ago, hopefully you will find it helpful (59 views when I last checked). Great job it’s looking really good! Really pleased with the wardrobe and shelves, thank you. I painted it at the weekend and it looks great. Hi Richard, We are very pleased with the shelving units, thank you and happy Easter. 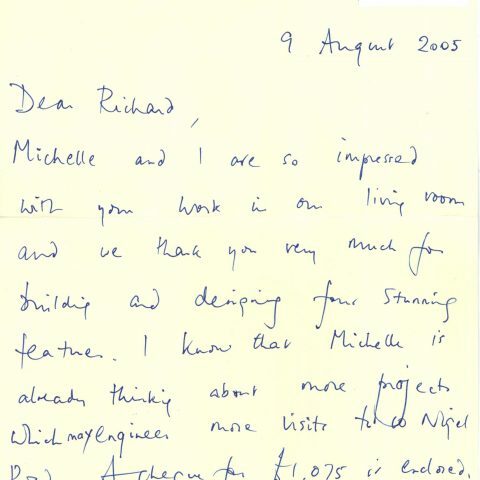 Dear Richard. I hope you are well. Sam is loving his revamped bedroom and the cupboards etc are a great success!